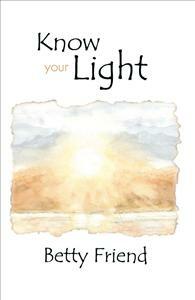 'Know Your Light' offers encouragement in connecting with your spiritual Self. Aligned with Course in Miracles thought, an intuitively chosen page in quiet times will speak to you. Who you really are is so awesome and so uncontained. It does not fit into the shrink wrap of the human body. In a moment you have decided to try the littleness but you are not that idea. Invite dissolution of encapsulation. Who is looking out of everyone's eyes? There is a Oneness that will so touch your heart at depth that you will never be the same as you invite and allow. So, who is looking out of your eyes? Who?